​Nearly two-thirds of the Earth’s surface is covered by water. And when you combine the power, speed and efficiency of the Rolls-Royce engine with the MKII’s advanced aerodynamic upgrades and the superior hydrodynamics and shallow draw depth of the Wipline 3450 amphibious floats, you have a seaplane that can get you to and from more of it. Tropical islands. Inland rivers. Back country lakes. They are all in a day’s work – or play – when you are flying a Soloy MKII. Whether you are in search of a big catch or a big contract, it’s a do-it-all amphibian. 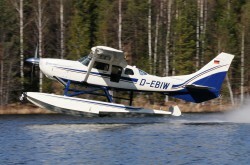 With the agility of a much smaller aircraft, the MKII gets up on the step faster and off the water sooner – an unbeatable combination to unlocking the wonderful world of water flying.